Duchess Kate Middleton’s engagement ring is the same one Prince Charles presented to Diana Spencer in 1981. Like many things about the ill-fated romance between Prince Charles and Princess Di, this celebrity engagement ring caused quite a scandal when she chose it over several others and opted not to have a ring custom-made. When originally purchased, it cost about $60,000; a pittance to the royal family at the time. 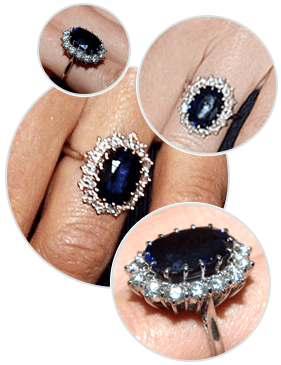 The ring and its so-called “commoner’s sapphire” is now one of the most sought-after jewelry designs on the planet. 18-carat sapphires are costly, and perfect ones like the one in Princess Diana and Kate Middleton’s engagement ring are difficult to come by. Get the look of the royal engagement ring without breaking the bank: Choose a sapphire halo ring in a size that suits your style and looks right on your hand. In the event you’d like to give a nod to the royals, enjoy the luxurious look of sapphires, and keep your own sense of style intact, consider something a little different: A halo sapphire ring set in platinum or white gold. This example from Brilliance has lovely pave-set sapphires dancing down the shank for a look that’s both elegant and unique. Princess Diana and Duchess Kate Middleton are two of the most-discussed women in all of Britain’s history. Both beautiful, both high achievers, and both mothers to royal heirs, they have much in common. Princess Diana was born on July 1 of 1961 and before her marriage to Prince Charles, bore the aristocratic title “The Honorable Diana Spencer.” She became “Lady Diana” or “Lady Di,” as many loved to call her, when her father inherited the “Earl Spencer” title in 1975. Her life was private until the announcement of her engagement to Prince Charles. Duchess Kate Middleton, properly known as Catherine, Duchess of Cambridge and sometimes lovingly referred to as Princess Kate, was born on January 9 of 1982. Her husband, Prince William, Duke of Cambridge, is second in line to succeed Queen Elizabeth II as the monarch of not just the United Kingdom, but of 15 other Commonwealth realms. Duchess Kate studied art history at Scotland’s University of St. Andrews, which is where she and Prince William met in 2001. Their engagement was announced nine years later, on November 16 of 2010, and their wedding took place on April 29 of 2011 at Westminster Abbey. With her background in art and fashion, it’s not at all surprising that Duchess Kate has made her way onto a number of “best dressed” lists. Despite her posh appearance, she is a stalwart patron of a number of charities and is a volunteer leader with north Wales’s Scout Association. What Our Experts Have to Say about Duchess Kate Middleton’s Engagement Ring. As celebrity engagement rings go, the one shared by Princess Diana and Duchess Kate is nothing less than incredible. The 18-carat center sapphire is estimated to be worth approximately $300,000 retail, and the entire ring is thought to be worth about half a million dollars retail, although its fame makes it much more valuable. Replicas are available in various sizes, but most contain smaller gems more suited to everyday activities. Celebrity engagement rings are always exciting to see, and it’s not at all surprising that the engagement ring Kate Middleton now wears is among the most famous pieces of jewelry of all time. Despite its ever-increasing value and the prohibitive cost of large sapphires, it is completely possible for us commoners to enjoy replicas, similar-looking rings, and sapphire engagement rings of different types with the help of Brilliance. Whether you chose from our many popular designs or decide to create a royal engagement ring all your own, you’ll love the way our designers take inspiration from celebrity engagement rings like this one to create the perfect match for your own love story.